Calder White lives in the cold, clear waters of Lake Superior, the only brother in a family of murderous mermaids. To survive, Calder and his sisters prey on humans, killing them to absorb their energy. But this summer the underwater clan targets Jason Hancock out of pure revenge. They blame Hancock for their mother’s death and have been waiting a long time for him to return to his family’s homestead on the lake. Hancock has a fear of water, so to lure him in, Calder sets out to seduce Hancock’s daughter, Lily. Easy enough—especially as Calder has lots of practice using his irresistable good looks and charm on ususpecting girls. Only this time Calder screws everything up: he falls for Lily—just as Lily starts to suspect that there’s more to the monsters-in-the-lake legends than she ever imagined. And just as his sisters are losing patience with him. 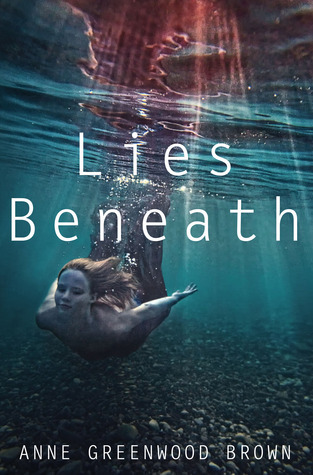 Lies Beneath is not just another mermaid story. Right away, I knew this book would be different, and the different surprised me. The story is told from Calder’s point of view, a brother to three mermaids seeking revenge. Calder’s job is to get close to Lily, the daughter of a man who is responsible for their mother’s death. While Calder is a merman who needs to kill humans in order to absorb their energy, he is not a cold hearted killer. He’s different and that difference brings him into Lily’s world and her heart. The relationship between the two develops past the hunter/hunted. Calder makes himself appealing to Lily, trying to win her over and as a result ends up with an outcome he didn’t see coming. Calder is the perfect wounded hero, trying to survive and do the right thing at the same time. I loved watching him struggle and grow through the challenges his quest (and his sisters) presented. Lily was a fun character to read as well. She’s a take no prisoners kind of a girl with a love for poetry. When she finally opens her heart to Calder, she doesn’t back down. They’re adorable together! I loved the more realistic take on the mermaid lore. It was nice to see the monster aspect of beloved creatures. Anne explores that in the most profound way that is very appealing. I really enjoyed this book and I really can’t wait to read what happens next. Lies Beneath comes out June 12th!